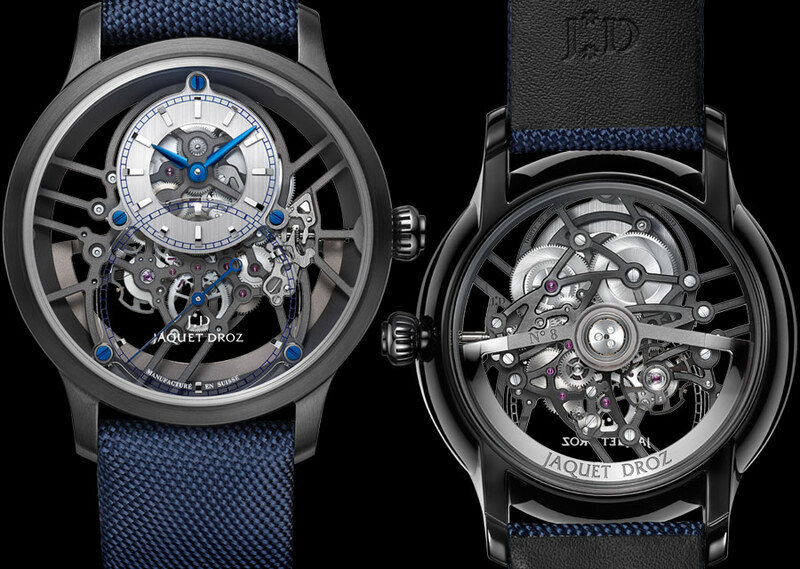 After unveiling it in Basel last year, Jaquet Droz is offering a new version of the Grande Seconde Skelet-One in 2019. As elegant as it is atypical, this edition combines the very modern chasing of its movement with a black ceramic case and blue elements. Designed over two and half centuries ago, the Grande Seconde by Jaquet Droz never ceases to amaze. Marrying every facet of its time and era, this ever-evolving piece reinvents details and finishes with each variation, to both surprise and astound. Its “Skelet-One” skeleton version, presented in 2018, marked yet another break: it was the first time the Grande Seconde did away with its dial. In its place: light, lightness and transparency. The Grande Seconde saw both its architecture unveiled and its power laid bare. Sculptural and enhanced, the Grande Seconde Skelet-One began a new chapter in the history of time as told by Jaquet Droz. Today, the piece returns with a new feature that gives it added modernity: a ceramic case. With a diameter of 41.5 mm, it’s in perfect harmony with the Grande Seconde Skelet-One’s open movement structure, featuring a black “NAC” coating that intensifies its power and modern, masculine character. Its straight lines contrast with the ceramic case’s skillful finishing, with a satin-finished top just like its lugs. 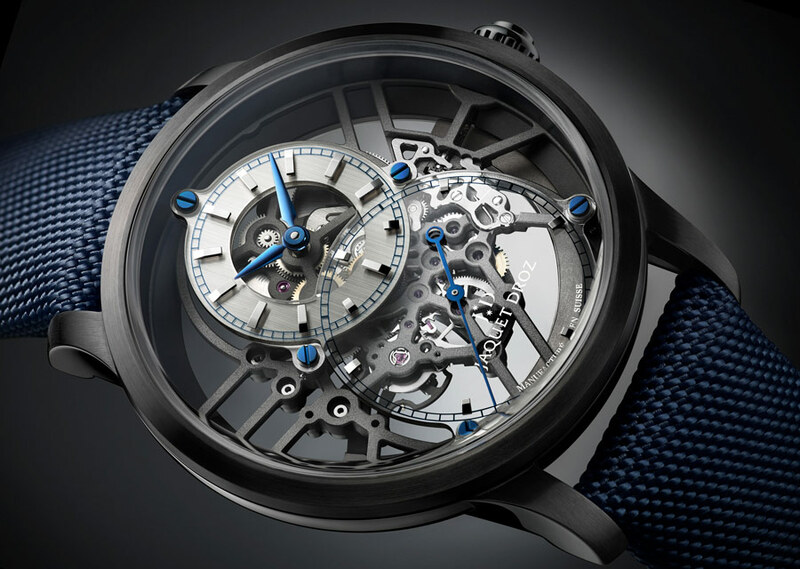 In contrast, its polished sides foster a play of light that is amplified by a double sapphire "glass box” on the top and bottom, offering the largest possible opening onto the skeleton movement. Watch lovers will notice that the movement plate stretches all the way around the case, which itself does away with the casing ring. With this new construction, the gear train is entirely suspended and fixed to the skeletonized bridges that cross over the movement. The latter has been the subject of many finishing details that are evocative of the Fine Watchmaking category to which the Grande Seconde Skelet-One Ceramic belongs. In pure watchmaking tradition and a clear nod to its heritage, the skeleton movement features blued steel screws that fix together the stainless steel hour circle and the sapphire dial. Each of these screws is “indexed,” meaning they are turned towards the center of the dial. For this new Skelet-One Ceramic version, the indexes are made of 18K white gold and the hours and minutes dial is crafted from steel. Vertically brushed, it catches every ray of light, ensuring perfect readability. As for the grande seconde dial, it is made from sapphire to offer an unobstructed view of each of the movement’s details. With the same objective of total transparency, the 18K white gold oscillating weight has been entirely skeletonized to avoid masking the slightest detail of the caliber, which makes a circular revolution around the case. The watch is worn on a blue canvas bracelet. Powerful and exclusive, the Grande Seconde Skelet-One Ceramic continues the centuries’ old odyssey of telling time at Jaquet Droz.